With three days to spend in bustling Shanghai, you have time to explore city highlights—old and new—and to get out of town and experience the charm of one of the ancient water towns on the Yangtze River Delta. See below for suggestions on how to best spend your 36 hours in Shanghai. 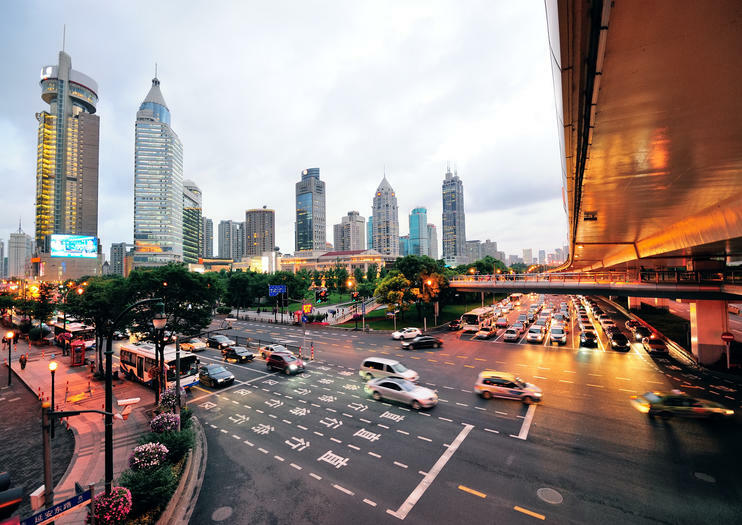 Get oriented on your first day in Shanghai, a city of some 24 million people, with a guided sightseeing tour to some of its top attractions, including the Bund, Pudong skyscrapers, French Concession, Yuyuan Garden, and Jade Buddha Temple. Choose a private tour to see the sights most important to you, or if you’d rather explore at your own pace, opt for a hop-on hop-off sightseeing bus with stops at locations around the city and narration. End your first day with a dinner cruise along Shanghai’s Huangpu River to see the iconic skyline illuminated at night. Many cruises offer dinner onboard for a complete night out. Take a deeper dive into Shanghai's history and culture. Depending on your interests, you might spend the morning on a walking tour of neighborhoods such as the Old French Concession, Shanghai Old Town, or the Jewish Quarter. Alternately, you could hop in the saddle to tour the city streets by bike. In the afternoon, visit one of the city’s many excellent museums, such as the Shanghai Museum or Shanghai History Museum, or do some people watching in People’s Square. Wrap up another day of sightseeing with an evening street food tour or bar hop through the Bund and Old French Concession. After two days in Shanghai, it’s time to escape the modern bustle for a day in rural China. Reconnect with the area's roots as a port town with a day trip to a nearby ancient water village. Tour the gardens of Suzhou—a UNESCO World Heritage Site—explore the canals of Zhujiajiao by boat, or learn why Zhouzhuang is considered the Venice of the East. Alternately, travel to Hangzhou by bullet train for a day touring West Lake. Upon your return to Shanghai, sit back, relax, and watch the gravity-defying stunts of a professional Chinese acrobatic troupe at one of the city’s many theaters. Experience the incandescent beauty of The Bund, Shanghai’s cosmopolitan cultural district, on an evening tour of the waterfront. Accompanied by an expert guide, see the city’s most significant landmarks under the atmospheric cover of darkness; board an evening cruise boat to watch the city sparkle from the shimmering Huangpu River, then stroll the area to admire the historical Peace Hotel. Hop into a trolley to enjoy spectacular views of Nanjing Road and enjoy the convenience of round-trip transportation from your Shanghai hotel. Discover a side of Shanghai it takes a local to know on this private foodie walking tour. Explore main streets and back lanes as you snack and slurp on delicacies like soup dumplings, roast duck, and mango pudding—enough for a full meal. Finally, enjoy a Shanghai classic: a Huangpu river cruise. Calling all revellers, this 4-hour Shanghai evening tour showcases the city’s nightlife hotspots. In a small group limited to 10, you’ll visit ambient bars and a swanky club in the Old French Concession and The Bund (Waitan.) Enjoy a glass of wine, beer, or spirits in every bar and conclude your evening at M1NT, a nightclub famed for its shark tank and luxurious decor. Hotel pickup and drop-off, and entrance fees are included. Stroll through the Shangai's trendy French Concession neighborhood with a private guide on this walking tour. Follow your guide's lead to unearth hidden courtyards, Art Deco buildings, and typical Shanghai street scenes. Highlights include the Lanxin Theater, the Cathay Mansion, the former residence of Dr. Sun-Yat Sen, Fuxing Park, and others. Choice of departure times to fit your schedule. Discover the historical heart of Shanghai’s ancient Jewish quarter on a 2-hour tour of the Hongkou District. Accompanied by a knowledgeable guide, delve into the captivating history of Chinese Judaism; visit the verdant splendor of Huoshan Park and browse intriguing exhibitions in the Jewish Refugees Museum (Ohel Moishe Synagogue). Catch a rare glimpse of daily life in a historical local neighborhood and gain fascinating insight into the culture from your passionate guide. This is a private tour just for you and your party. Shanghai is one of China’s most cutting-edge cities, but it’s also home to a picturesque Old Town. Cover the highlights on this scenic guided walking tour, which covers standout sights like Yu Garden, the bird and flower markets, and traditional architectural landmarks. Escape the tourist track and learn about the city’s enduring crafts and customs.